The weight if the diamond is measured in carats. The metric carat equals 0.20 gram. A carat is the unit if weight by which a diamond is measured. 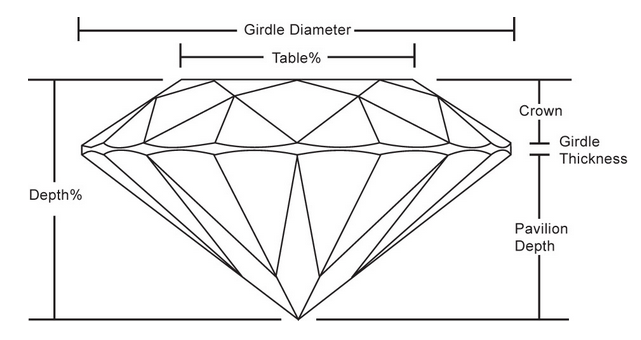 Because large diamonds are found less commonly than small diamonds , the price of a diamond rises according to its size. The cut of a diamond has a tremendous affect on its brilliance. Even if the diamonds has perfect color and clarity a poor cut can make a diamond look dull. Cut is probably the most important quality factor, and most challenging of the Four C's. Most diamonds contain some inner flaws, or inclusions that occur during the formation process. The visibility , number and size of these inclusions determine what is called the clarity of a diamond. Diamonds that are clear create more brilliance, and thus are more highly prized and priced. Most diamonds have a slightly yellow or brown color. With the exception of some natural Fancy colors (blue , pink, violet, green or red) , the colorless grade is the most valuable. Colorless diamonds are the most desirable since they allow the most of light (sparkle).